Freyja, the Northern goddess of beauty, love, “productivity”/(fertility), and magick, is one of the more interesting goddesses you will stumble upon in Northern traditions. She was the sister of Frey, the God referred to as “Lord” who stood for wealth, fertility and prosperity. Likewise, Freyja was referred to as “Lady”. She also had several bynames: Syr (meaning sow), Gefn (related to the goddess of Denmark) and Horn(coming from a word for flax, hence why Freyja is depicted as spinning a thread or wool). A popular title of hers was “Vanadis”: this is because she was born in Vana-heim. It is assumed she is the daughter of Niord and Nerthus, or Skadi. Out of all the Goddesses, she was said to be the most beautiful and beloved. Now, depending on the region you look at- some traditions (Germanic ones, for instance) tend to associate her with Frigga. Others (Norway, Sweden) see Freyja as an entirely separate deity. (Being from Norway, I may be biased, but I view Freyja as separate from Frigga). The Gods, astounded and in awe of her beauty, gave her the realm of Folkvang as well as the great hall Sessrymmir (which means “roomy-seated” and implies the she had quite a lot of guests). Snorri Sturluson, who translated the Prose Edda, tells us that Freyja survives the other Aesir (“which is not surprising since medieval Christianity did not offer its converts a deity who blessed healthy “productivity””[paxson]). Some thought Freyja to be a personification of the Earth. She was said to have a husband, Odh(or sometimes known as Odur, who was symbolic of the Sun), but he was a rover and eventually found himself weary of his wife and left to roam the world. Freyja looks for him, and mourns his disappearance*, but she takes lovers here and there anyways. This is why Loki describes her as the “harlot of the Gods” , points out his disapproval at her relationship with her brother, and accuses her of sleeping with every male at the feast. Her father, Njordh, looks at it differently and reasons that a woman should have a lover in addition to a husband. This shows some differences in the views of love and fertility between the Aesir/Vanir. *An interesting note: It is said that when she cried as she searched for her missing husband, her tears were transformed into gold. She shed many tears as she searched the world for him, which explains why gold can be found all over the Earth. Freyja was not all about love, however. It was thought that she personally led the Valkyrs down to battles, choosing and claiming which heroes and warriors were to be slain. She would take those who were slain back to Folkvang and entertain her guests. In her company she liked to keep pure maidens, faithful wives, and other women. She liked to invite the wives of the slain to be with their lovers and husbands after death. Guerber suggests that “The joys of her abode were so enticing to the heroic Northern women that they often rushed into battle after their loved ones were slain, hoping to meet the same fate; or they fell upon their swords, or were voluntarily burned on the same funeral pyre as the beloved remains”. In Grimnismal it is said that Freyja takes half the slain and the other half go to Odin. This side of her is the reason for depictions of her to be the way they are: usually she has on a helmet, a corselet, shield and a spear but the lower part of her body has a flowing almost see-through feminine garb. This shows the different sides of Freyja. “Snorri tells us that she (Freyja) taught the craft of Seidh to the Aesir.”(Paxson) and it is thought that Freyja was Priestess to the Vanir. Seidh tends to be oracular, a means for divination, and smiliar to shamanism. It appears throughout several sagas and most commonly these rites are performed by women. “The essentials for performing it were the erection of a platform upon which the practitioner sat, the singing of spells (galdr) and trancework or a falling into a state of ectasy and altered state by the leader”(Davidson). (To explain the full scope of Seidh would take too long, so that is all I will write on it here). Because Odin, at one point, shows that he knows Seidh magick- it is thought that Freyja was the one who originally taught it to him. 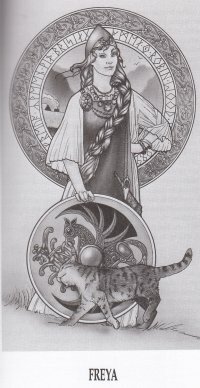 More evidence for Freyja being the one to teach this type of magick: the volva (Volvas were women [usually] who would divine, see into the spirit world, etc) seen in Saga of Erik the Red is wearing clothes made from catskin (further down I will explain the significance of the cat and Freyja). She is and was often invoked by lovers, called upon in love-rituals, etc. In Germany, her name is sometimes used as the verb “to woo”. She is also invoked for productivity, but be careful! Freyja is a fertility goddess. Specify what “productivity” you are asking her for. When making an offering to Freyja, it is common to offer pork, honey and other sweets, sweet tasting drinks such as ale. Many colors represent her: Gold, green, red. A combination of these can be placed on an altar. It is said that she is a goddess who will randomly appear in people’s lives. There is a tale that as goddess of beauty, Freyja had a fondness of glittering/shiny things and jewels. One day she saw four dwarfs carrying a necklace they had fashioned. This necklace was called Brisinga-men. It was the most beautiful, shiny thing she had ever seen. She become beside herself and obsessed with having this necklace. She begged the dwarfs to give the necklace to her, and they refused. So she promised to grant them a favor in turn for the necklace, and they accepted this. It is said the beauty of Brisinga-men made her so much more charming and beautiful that the Goddess never took it off and could only rarely be persuaded to loan it to other deities. Another item she was in possession of was known as the falcon gard/plumes. This was something that enabled the wearer to fly through the air like a bird. Only twice was it ever borrowed, by Loki in fact! She also owned a chariot, which is sometimes shown to have been drawn by her cats. (Cats were her favorite animals and often are used to symbolize her, making them Freyja’s sacred animal).